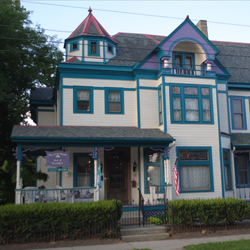 Harrison House Bed & Breakfast greets visitors to Harrison West at the intersection of West Fifth and Harrison Avenues. What better gatehouse to the community than a beautifully ornate Victorian home that welcomes weary travelers? The home has been a bed and breakfast since 1990; in the decade before to that, it was an executive retreat for Cardinal Industries, who bestowed the name “Harrison House” on the dwelling. Lynn Varney has been the owner of Harrison House for 5 1/2 years taking the baton from Sandy and Don Davis, who were proprietors for the ten years prior to Varney’s tenure. Lynn was a Worthington resident looking for a lifestyle change, and after much soul-searching, she concluded that she wanted to operate a bed and breakfast in northern Ohio. Her realtor went to work researching her desired locale, but no properties looked likely to fulfill her dream. Then one day, her realtor asked her to “ just take a look” at a property that had become available in the Short North. As soon as Lynn walked onto the porch, she realized that she was destined to remain in Columbus and take the reins of the Harrison House Bed & Breakfast. Visitors to Harrison House run the gamut: guests of various OSU departments, parents visiting their college student children, business travelers, travelers passing through on their way across the country and other tourist-types. Of course, Harrison House also welcomes a fair number of family members of Harrison West residents whose homes are too small (or perhaps too messy) to accommodate visiting relatives. Harrison House offers four rooms, each with its own private bath. A fifth room can be “annexed” to one of the other rooms to create a suite with a shared bath. The venue offers free onsite parking, free Wi-Fi, bathrooms stocked with the necessary toiletries, and irons and ironing boards. Lynn serves a generous and hearty breakfast to her guests each morning and offers complimentary beverages (some, perhaps, even of the “adult” persuasion). She’s a fountain of knowledge for her guests about things to do in the area because she rarely strays far from the Short North these days. “I have a circuit,” she says. “I start at the inn and walk to the North Market, then I walk up High Street to Fourth Avenue and back down to the house.” She prides herself on her primarily local shopping habits and the fact that the average speed in her car is 21 miles per hour; she racks up only 5,000 miles per year. Lynn is clearly enamored with her life as a Short North innkeeper! Lynn loves Harrison West and the other Short North neighborhoods for their friendliness, their safety and the pride that people take in their properties. She has recently upgraded and performed major maintenance on Harrison House with a fresh coat of paint (in the many-colored Victorian tradition) and new landscaping for the yard.